It’s the first Otakus Must Die episode of 2016! The team opens the show with their final thoughts on the Fall 2015 season, followed by several reviews of other series that they’ve recently been watching. 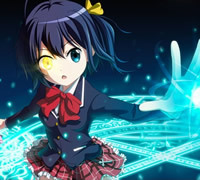 Jared is elated to find out that Alex finally watched his favorite anime of all time: Love, Chuunibyou and Other Delusions, as well as the School-Live! series that he recommended last episode. The show finishes out with another seasonal lineup discussion, this time for Winter 2016 anime season… and Jared is not impressed.